Tucked away at the southern end of the Gulf Island chain Saturna Island is easily the least spoiled of the Gulf Islands. A remote and sparsely populated rural hideaway, with bountiful wildlife and tremendous natural beauty, Saturna Island features a variety of outdoor activities, including hiking, cycling, kayaking, swimming and fishing. Saturna was explored by Spanish sailors and named in 1791 after their naval schooner, the Santa Saturnina, one of the ships in the Spanish expedition that discovered the Strait of Georgia. 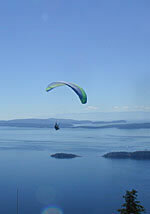 Tourism is important to the livelihood and economic well-being of most of the Gulf Islands. Visitors would be pleased to know there are now 7 campsites available in Narvaez Bay. There are also a variety of B&B and cottage accommodations. Reservations are recommended. Much of the population of Saturna is centered around Lyall Harbour and Boot Cove, and a few homes are scattered throughout the island. Nearly half of the newly created Gulf Islands National Park incorporates undeveloped wilderness land on Saturna Island. This park will be one of only two national parks in the Vancouver Island and Gulf Islands region - the Pacific Rim National Park being the other. Almost one half of Saturna’s stunning landscape of bays, valleys and high rock bluffs are protected within Gulf Islands National Park Reserve. Officially established in 2003 the park is indeed something special to experience while you’re on-island. The southern Gulf Islands are one of the most ecologically important—and most at risk—natural areas in southern Canada. Many plant species are at their northern limit or are found nowhere else in Canada—like the magnificently gnarled Garry oaks and the red-barked arbutus trees. Tidal pools shimmer with colourful and extraordinary sea creatures, and a myriad of seabirds, orcas, porpoises, seals and sea lions thrive on the bounty of the surrounding ocean. Exploring the national park reserve is best done at a leisurely pace, and in ways that leave little trace of your passing through. Although there are few facilities as yet in the new park, there are still some great experiences to enjoy. Try a picnic and short hike at Winter Cove. Enjoy a walk down to Narvaez Bay, or hike along Lyall Creek. Drive up to the top of Mount Warburton Pike to take in a panoramic horizon of ocean and islands laid out at your feet as falcons and eagles soar at eye-level. If you're travelling by boat or kayak, a stop at the stone house ruins at Taylor Point will stir echoes of an old quarry operation that once supplied the sandstone that graces some of Victoria's earliest grand edifices. To the north of Saturna lie Tumbo and Cabbage Islands, Pine Islet, and the Belle Chain Islets—also part of the national park reserve. The entire park totals 35 km2 of park land scattered over numerous islands, islets and reefs throughout the southern Gulf Islands, including major portions of North and South Pender Islands. The waters adjacent to park lands are also managed by Parks Canada, bringing another 26 km2 under protection.